While lunching at Maenam, Rich Guy and I noticed a new Korean restaurant across the street. We really couldn't make out the name or remember to tell you the truth. Not really thinking about it, we filed it into our subconscious for the next time we ate. Rich Guy was actually leaving for a couple of months (for real this time) and this was like another one of his famous "going away" meals. Joining us were Viv and Whipping Girl. 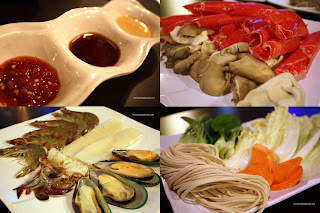 For tonight, we were originally thinking of visiting Octopus Garden; but we weren't in the mood to spend $100.00 per person. Furthermore, I'm sure my daughter wouldn't be a ble to appreciate the food there. Thus, we changed our plans and decided to give Dae Bak Bon Ga a go. Apparently the original location is on Robson and the AYCE BBQ or Shabu Shabu is only available there. Undeterred by that fact, we decided to get both the BBQ and Shabu Shabu for 2 people anyways. We added a Dolset Bibimbab and Japche for good measure. 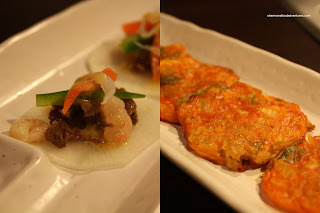 Prior to the Banchan, we were presented with 2 complimentary appetizers. The first being a thin slice of radish topped with meat, shrimp and veggies. We all thought this was bland and uninteresting. The second one was a veggie pancake and it was alright; but we'd prefer if it was actually hot. I guess we shouldn't complain much since they were free. For me, it seems like I get excited about the Banchan more than the actual meal sometimes. I'm really not sure why since they are quite simple. Included in this set was kimchi, seaweed, potatoes, sprouts, green salad and cabbage. They were all carefully prepared and I had to fight off Whipping Girl, so that I'd actually get some to eat. But I was getting all excited for nothing since you can usually get a refill of banchan at most Korean restaurants. Sizzling hot, the Dolset Bibimbab arrived with lots of daikon, carrot, zucchini, beef, shiitake topped with a raw egg. I quickly mixed in the kochujang with the rest of the ingredients. The darn thing was so hot, I almost burnt myself passing the bowl over to Rich Guy. Don't get me wrong, that is fantastic since it formed a really nice crust on the bottom (which is the yummiest parts). However, even without the hot stone bowl, the rice itself was a nice chewy consistency while still be soft. Predictably (for me at least), we got the Japchae. I guess it's the standard rice and noodle s when we go for Korean. Served hot, the Japchae was excellent. The noodles were the right consistency, veggies were not soggy and overall the dish was not greasy. Too bad it was such a small portion. If you look on the plate, it doesn't seem to fill it out much. Mind you, the price is roughly $5.00 cheaper than places such as Hanwoori, Jang Mo Jib and Insadong. At the end we were stuffed and very satisfied with our meal. The food was well executed and the raw meats were fresh and plentiful. Being a new restaurant, it is both clean and roomy. However, the most important thing we noticed was the attentive and friendly service. For a Korean restaurant, that is no small feat. Even without those useless chime buttons (cuz no one ever seems to answer it anyways), we got everything that we requested and the staff actually checked on us every now and then. A solid dining experience. Oho, so you went to the korean restaurant with weird name (I'm sure it's much more meaningful in korean). I've been to the orignal location on Robson and had one of the most delicious grilled kalbi beef meal ever. My mouth starts watering whenever I think about it. Now that they have a new location in Kits, and hopefully free parking, I may go again sometime soon. You got that right Holly, I could not even remember the name when I was talking to Rich Guy. "Let's go to that Korean place... I forgot the name, the one near Maenam...". Food is pretty solid. Parking wasn't too bad, especially at night. I was there this week again. Though I didn't get the free appies this time around. Not sure what was up with that. Oh well, the kamjatang (pork and potato soup) was excellent, give it a try if you go back. A place I used to go to in Edmonton served whole romaine leaves to wrap the grilled meats in, along with garlic cloves to be thrown into the wraps whole. Anything like this in Vancouver?